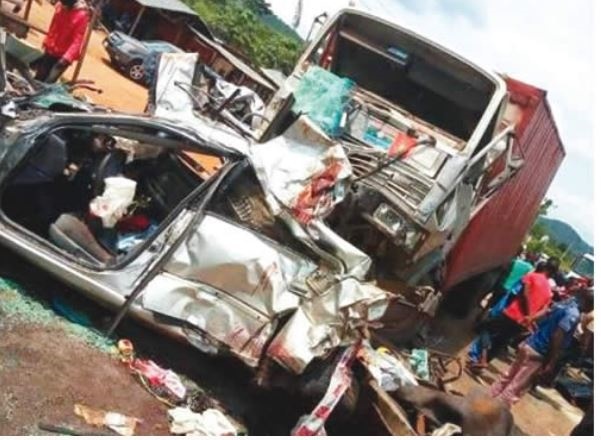 “The incident occurred when an articulated vehicle conveying a caterpillar and a mini-bus collided head-on"
The expectations of nine person were abruptly cut short after their bus was involved in an auto crash on the Enugu-Port Harcourt Expressway. Apart from the deceased, 12 persons also sustained injuries in the crash. The Police Public Relations Officer in Enugu, SP Ebere Amaraizu, confirmed on Monday. Amaraizu noted that the incident happened on Sunday at about 8pm. He said the accident occurred on Enugu-Port Harcourt Expressway in Awgu Local Government Area. “The incident occurred when an articulated vehicle conveying a caterpillar and a 508 mini-bus had a head-on collision. “The passengers of the mini-bus were believed to be worshipers," he said. Amaraizu said that the corpses of the nine persons had been deposited at the mortuary of the University of Nigeria Teaching Hospital, Ituku/Ozalla near Enugu. According to him, the 12 persons critically injured had been rushed to the UNTH for medical attention.